Once, I had to read a lecture about language and discourse style of Russian media for students of Russian as Foreign Language. And it was quite a challenge. Why? 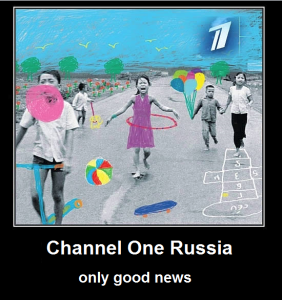 I downloaded a couple of broadcasts of late news for several recent days, naturally, it was Channel One Russia (First Channel, the main channel of Russia). And... they were funny and stupid, like a travesty of news. For example, there was kind of a story about caught American spy with false mustache and bunch of sunglasses, which were proudly taken close-up – if audience has doubts whether real spy does use childish equipment like this, one could examine it in details and make sure. I don't watch TV for ages, but I always thought that TV news must be about... news, more properly, big news. And about real news. The fact is that they are not. That's why I think that analysis of news content with calculation of time devoted to every topic could be quite interesting. So when I ran into example of that, I assumed it could be interesting for broader readership. I translated it into English and supplemented it with my humble infographics. So, behold! This is a time calculation of every story of one Russian TV news broadcast, completed by Elena-Elizaveta Shadchneva and published in her Facebook post. The subject of the research is a news of February 27, 2016, it's the late news broadcast (9 PM) from Channel One. I converted the plain text of the original FB post into table and highlighted keywords with bold type. Also I marked with red color news blocks which were shorter than 1 minute: they must be marginal, according to logic. You can judge whether it's the case. Screen time in the table measured in seconds. The text content is original one of Ms Shadchneva, with her comments, sarcasm and emotions. As to me, I'm not even familiar with current Russian internal political issues. 8 As always cheerfully, sweet Ekatherina Andreeva reported about a transfer of some „robot systems complexes“ to the mine performed by the Russian Emergencies Ministry. Eighth news, 30-second story. 9 [Opposition politician] Boris Nemtsov who was killed a year ago [near the Kremlin] was mentioned. It was ninth news with a 40-second story. The economic crisis in Russia, rise in prices, falling living standards, social protests and other issues – the trifles, which seem actually to be not worth to mention in the news. Basically, that's all one needs to know about protection of Russian-speaking people in Russia.